How do I access Long Tail University? Who Gets Long Tail University Access? All annual subscribers will be given access within the app. Any monthly subscribers or Lifetime owners who have purchased LTU previously will be given access within the app. All LTU owners without an LTP Cloud account will be given access to the LTU site. 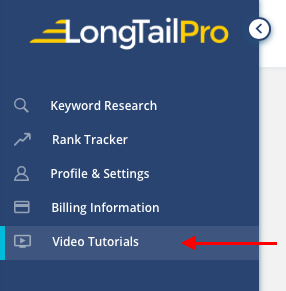 If you are a subscriber with access to Long Tail University, you can view it from within the app! All annual subscribers have access automatically. Just go to the Video Tutorials page, and select the "Long Tail University" section from the drop down menu. You can log in to Long Tail University on the LTU website here. If you can't access the videos, please contact our team from the in-app chat or by email.